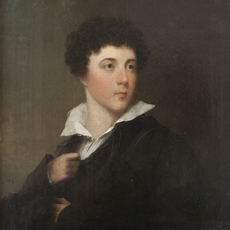 John George Phillimore was one of several generations of the Phillimore family to be educated at Westminster School. Admitted to Grant’s House in 1817, he was elected a King’s Scholar in 1820. He went on to Christ Church, Oxford in 1824. He pursued a career in the law, rising to the role of QC, before becoming a Whig MP for Leominster in 1852. His portrait, reproduced to the right, hangs in the School Library. He is also one of a the few individuals to have his name carved twice on the School Gateway. In 1822 his name was carved on the back of the archway, in 1824 it was carved again, this time on the front.